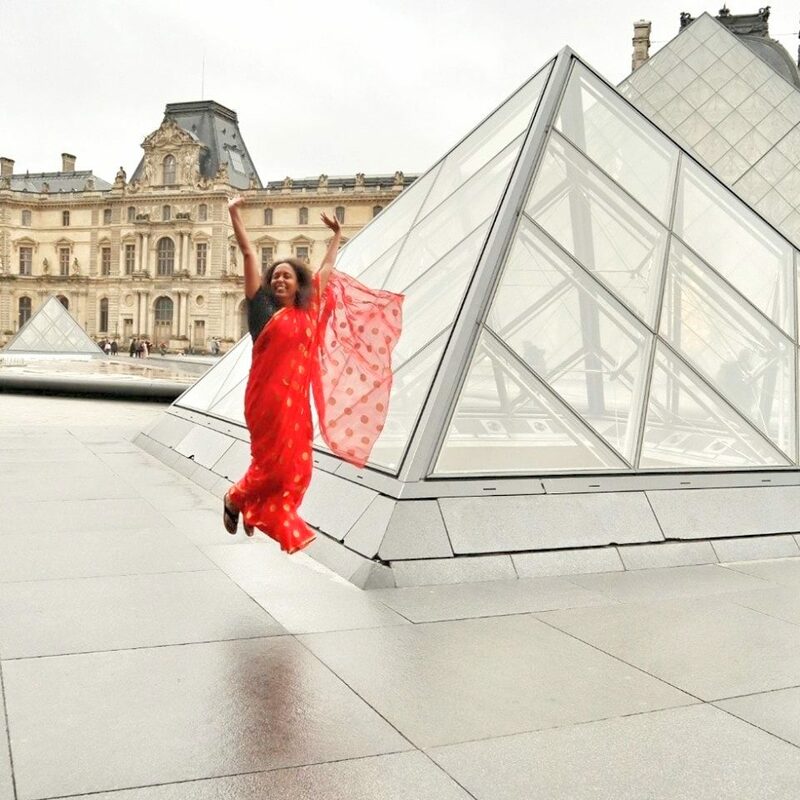 I love to travel, be it with extended family, solo or on sponsored trips. However there are three constant companions that go on every trip with me, my camera, my cell phone and my laptop. I like my camera and my cell phone quite a lot. But I could not say the same for the laptop because it would make my cabin bag a pain to lug around. My cabin baggage always has the SLR and a few lenses, they in itself weigh quite a lot. When I would add my laptop to it as well, it would become quite miserable particularly in those situations where I had to walk a lot. Then I got an email from the folks at Intel/Sony that they could offer me the use of their Sony Ultrabook (Duo) and I could keep it too. They were shipping it from Australia. After a few hiccups at the Indian customs I got the Sony Ultrabook. The first trip we did together was Jordan. After that it went with me to Thailand, Kashmir and Pragpur as well. In short, it is my newest traveling companion. And I am quite happy with it. Here are some of the reasons why! It Talks to Other Devices: I owned (actually I won it in a blogging competition) a fancy tab, but after a few days I gave it away to my younger nephew. For me it is vital that the device talks to other devices like my camera and the cell phone. The fancy device that I won refused to talk to my camera and my cell phone. Its own camera was not that great, so it was of no use for me when it came to my travel needs. When I travel I like to post pictures and blog. To do this I need devices that are willing to communicate to each-other. With the new Sony Vaio Duo I can download the pictures from my camera and the cell phone easily to the machine. So there we go, it perfectly lets me share pictures from whichever device I want. It is a Tab + a Laptop: I do not like typing on a touch screen with the Intel powered Vaio I can flip open the machine and out comes the keyboard. 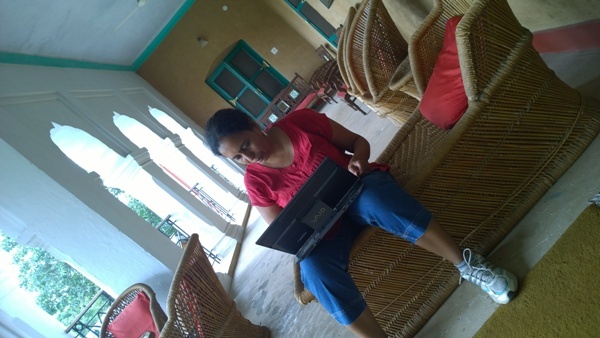 So typing out those blog posts that cannot wait till I reach back home is easier too. When I just wish to browse the machine becomes a tab! Now that is convenience! 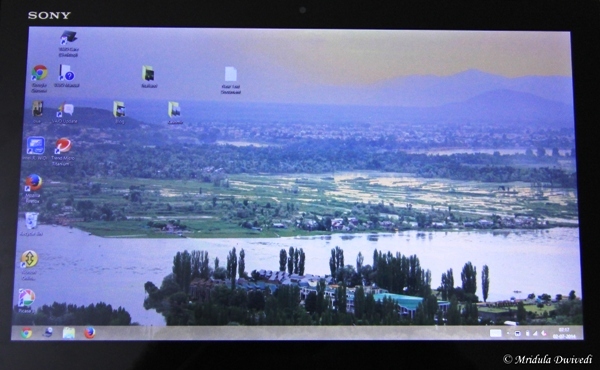 I can Lug it Around: There was a time in Srinagar when I did not feel safe about leaving my Ultrabook in the hotel room. It went with me on the walks and then to the bar in my backpack and I hardly ever noticed the weight. I am sure if I lugged my old laptop around I would not say so at all. Battery Life that Others will Envy: Also the Ultrabook has amazing battery life. If I charge it completely I do not need to charge it for about 9 hours. So I am free to sit anywhere in an airport, I am not bound to the charging points. Now it is a Tab! 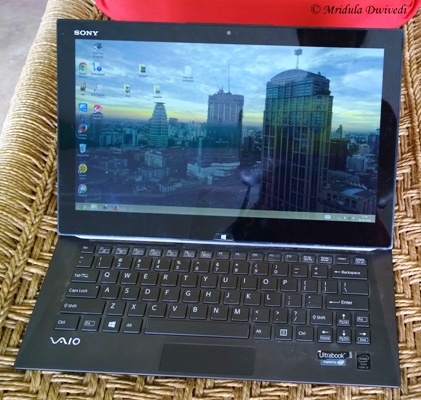 Overall I am mighty impressed with the Intel powered Sony Vaio Duo Ultrabook. It is going to be my permanent traveling companion for a long long time. Here is to many more trips together! PS. I hope you noticed at the beginning as well that I got the machine from Intel for review and it is mine to keep as well.